This is something that I don’t ever remember President Obama doing. President Trump had a meeting with wounded warriors and honored their sacrifices for our amazing country. 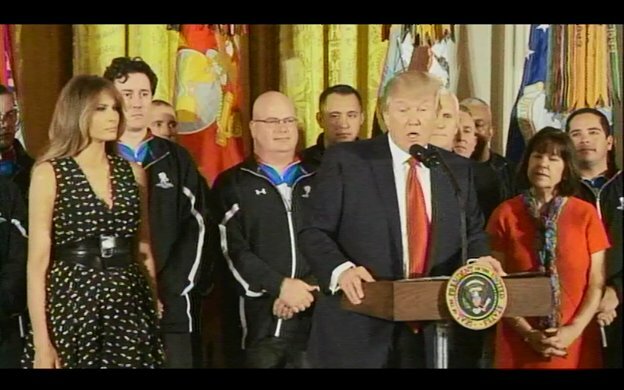 President Donald Trump and first lady Melania Trump honored America’s Wounded Warriors Thursday during a White House ceremony. The ceremony was part of the Wounded Warrior Project Soldier Ride, a four-day motorcycle event that united veterans from across the country. This is positively heart-warming and exactly how a Commander in Chief should behave. I think I could easily get used to four more years of this patriotic behavior.